Live Home 3D is a home & interior design software. The software is available on all devices and compatible with iOS, Mac OS and Windows including Windows 10. The multi-platform software can be used to create floor plans and three dimensional renderings of the same. Homeowners can use the software, so can home planners & architects or interior designers. The whole process facilitated by the app is easy, quick and precise. It is possible to create the plans for a whole house and to attend to all the furnishings in every room. The app uses the same foundation as the software. Live Home 3D Pro for Windows starting from $19.99. Get Live Home 3D Pro for Windows starting from $19.99. 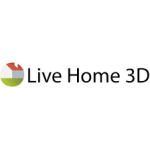 Get free Live Home 3D for Windows.